I was asked if I could post about making my Tarp for extra covered living space outside my Aspen Classic. 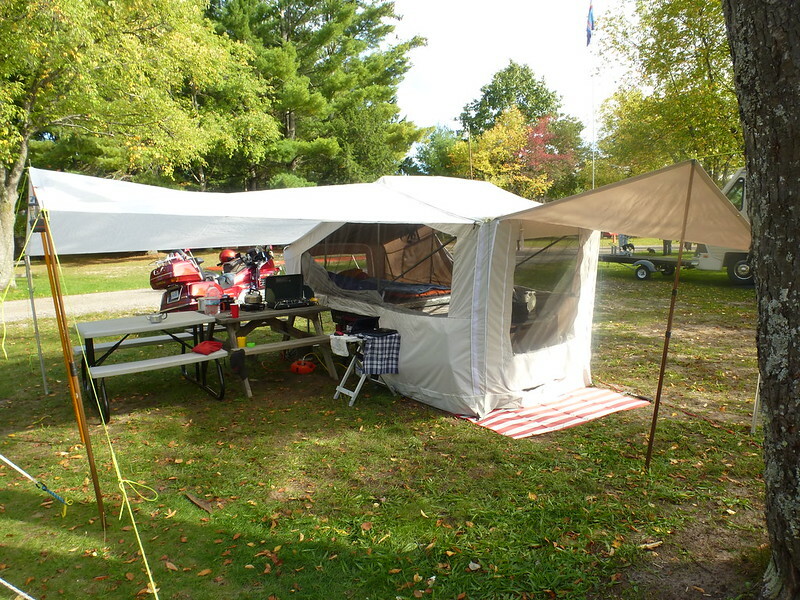 I believe the side was 10'x12', but check your camper to make sure of the size, and that you ave the full length soft sided velcro on your camper canvas. This thread has been on many of my projects for the past 3 years and I highly recommend it. Again, it works in a regular sewing machine. If anyone has more, or better pictures of this type of project please post!! Any recommendations on the poles, are they just the Walmart variety? My poles are a mix or 2 piece and 3 piece adjustable poles, No Name poles. I don't see a difference in use between them. the 3 piece are a walmart pole on got on EBay. The guy had them for $9 each plus shipping. I sent him a message to ask about shipping if I ordered more than 1. He asked how many I needed, I said 6, but depending on shipping. He said he had 5 left, send him $9 for all 5 poles and $4 shipping and I could have them...... So I did!! We bought 3 painters poles. Put pins on the end of two and a baseball on the 3rd one. Put the two out on the front and the one with the ball in the center. We only used it when we went to John's first event. Found we never spent time at the tent but stored the bike at night under it. 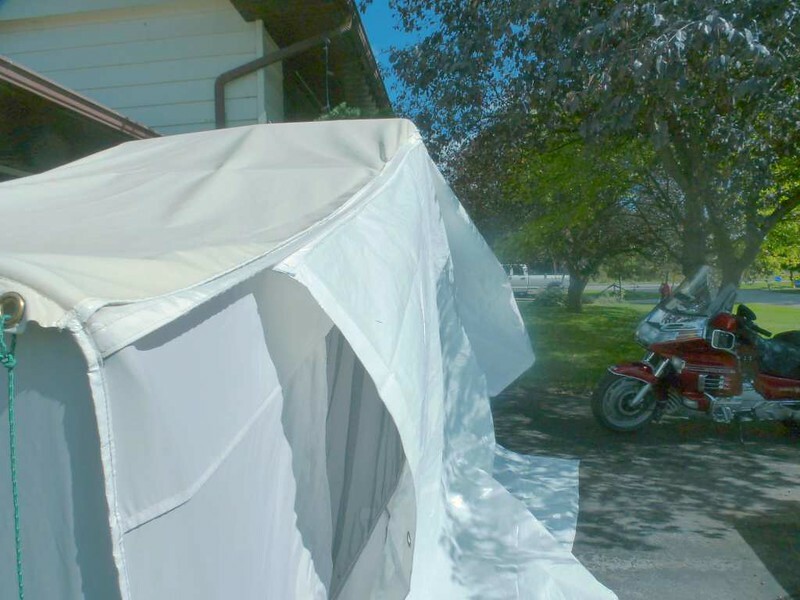 Jim and Deb, if my memory is correct, had a 2 sided room on the side of their camper and parked their bike in it. We just used a HF blue tarp and Estella sewed the velcro on it with her sewing machine. Maybe we need to get it out of storage and use it. Hope we did not use it to nail on the roof of the shop when the tree fell thru the roof. Still feel lucky the header broke the fall or it would have hit me harder than in did. When I made mine years back, I removed the grommets from the edge of the 10' x 12' tarp I was sewing the Velcro loop to and then folded over the edge/hem a couple of times just to reinforce the material before sewing the loop on. I got my white UV resistant tarps from this place in MI. 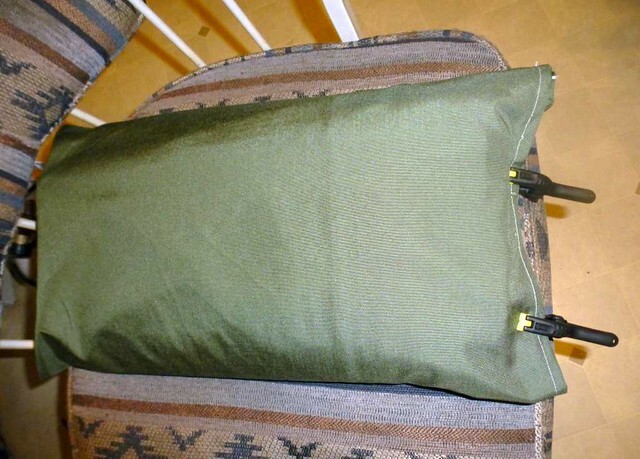 I then sewed up a bag from 1000 denier Cordura to keep it in when not in use/traveling. I have 2 of the telescoping poles already (came with the camper when I bought it) but I may shop around for a few more. I plan on setting up a base camp for several days at a time and I'm liking the idea of being able to have two "wings" (one on each side) if I want them to protect from the sun or the rain. Tim Tool Time Taylor is my hero! I want to make up a smaller one for the other side of the camper to cover the tongue, cooler and where I store my cover while set up. I have a piece of material thats about 7'x 6' that im thinking of using. That would keep the rain off the tongue area but also keep the sun off the cooler and offer some protection for when I open the windows on that side. Y'all are make us tent campers feel... well, inadequate. Oh I don't know about that! Your set up at NASR10 was quite impressive. Mine was sticky back (It was what I had on hand originally purchased off EBay) I had the same fear, but it wasn't an issue at all. I have all of the material on hand for making two canopies with the exception that I would like to have a few more telescoping poles. I do have enough two piece poles (6 foot 4 inch) that will work fine for the lower corners I think. I have also have two 7 foot 6 inch telescoping poles that should work for the peaks. I will be checking yard sales in this area as they often have the telescoping poles. I'll probably start the construction next month when I set the camper up for its spring cleaning. You should have enough poles. I use 3 poles, two shorter ones on the corners and one taller one in the center. Next time your at Home Depot or Lowes, get yourself 2 small spring clamps for each side of the tarp were the velcro attaches. stops it from "Unzipping". You should have enough poles. I'm doing two sides so I'll need 6 poles plus I need two poles for the front door canopy. So 8 total. You are right, I can make do with what I have, just wanting all to be the same telescoping type (OCD). I wish the front door canopy was actually useful when it rains..... I just captures water no matter how I angle/slope it. I just never bother with it unless Im set up for a week or so. John .... DO NOT use the stick on Velcro!!! It WILL gum up Nancy's sewing machine. Jims coming here in a couple of weeks on his way to Florida, I'll ask him about it. 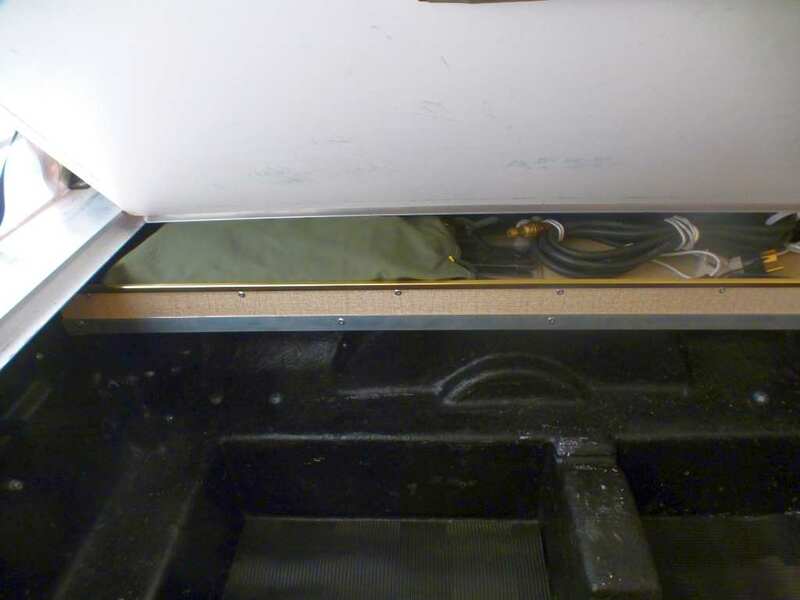 I was just thinking I could add velcro to the bottom side of the door awning, lengthwise, and have two small pieces of vinyl of some sort that would velcro to that to sheild the side to side rain....... probably never do it, but an idea. DO NOT use the stick on Velcro!!! It WILL gum up Nancy's sewing machine. I didn't have a problem at all with mine. Put two rows of thread down the velcro and never had an issue. I thought it might gum up, but it didn't.\, the needle stayed clean. Yes, I have four of them that I use for that purpose as wind can detach the Velcro strips from the tent body! I keep them clamped onto the bag I sewed for the canopy.